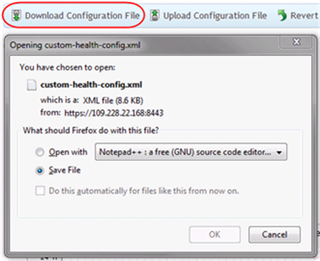 Within the health monitoring section of Plesk, click the Download Configuration File icon. This will download the health monitor's configuration to your local computer. Open the downloaded file in a text editor, scroll down and you will see the xml configuration for each monitor. In this example we will look at the monitor for CPU usage from web services. From this we can see that the monitor is enabled, the yellow threshold set to 20% and the red threshold is set to 25%. Make the changes you require and save the file. In this example the red and yellow thresholds have been increased to 30% for yellow and 40% for red. You can disable the monitor by changing monitor="true" to monitor="false". Back in your Plesk control panel, click the Upload Configuration File icon. Select Browse and locate the modified configuration file on you local computer. Click OK to upload and apply the new configuration to Plesk. You can check that your changes have been applied by hovering over the (?) tooltip next to monitor changes have been made to. A pop-up box will appear and display the alarm levels that are currently set.